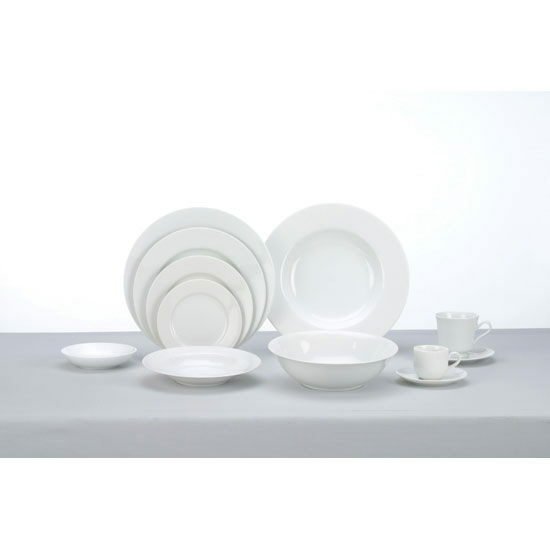 TRADITIONAL BASIC WHITE SETTING, AND A AN AFFORDABLE UPGRADE FROM DISPOSABLE CHINA. VERSATILE FOR USE AT FORMAL OR COCKTAIL RECEPTIONS, WEDDINGS, CORPORATE DINNERS, BUFFETS AND CASUAL BACKYARD EVENTS. AVAILABLE: DINNER, LUNCH, SALAD AND CAKE/APPETIZER/B&B PLATES, COFFEE CUP AND SOUP BOWL. ALL CHINA IS WRAPPED AND PACKAGED IN MILK CRATES FOR EAST TRANSPORTATION. * Please call us with any questions about our white china rental in Baltimore Metro area.